The *ation rhyme scheme has too many options. Anyway, I don't mean to sound like a lousy rat-killing redneck. I actually take great care to prevent suffering in animals, and I'd rather not kill rats at all. However, I think it's important to point out that my methods are more humane than most rat extermination conducted in the world. 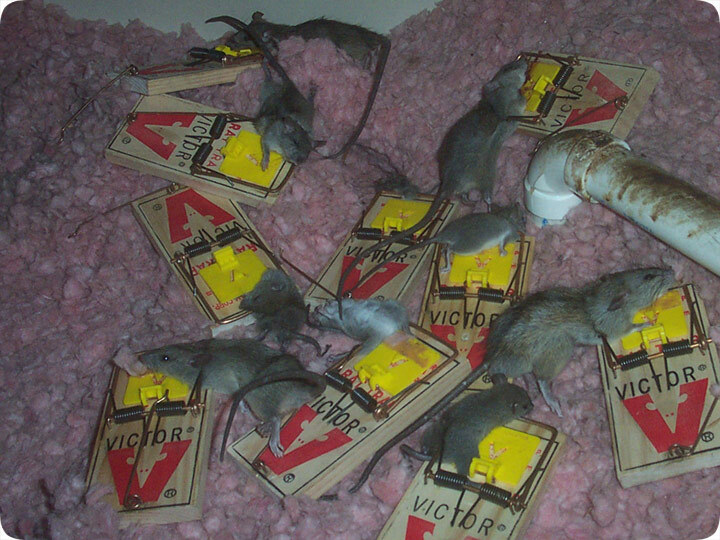 Most exterminators use poison, which causes rats to suffer. And they just keep using poison in the same place, over and over. What I do is solve the rat problem permanently, by sealing up the building so that no rats can get in or out. Then I set a bunch of snap traps, which kill instantly, and I get all the rats, and remove them from the attic. This job took place at an apartment building in Orlando. The attic was filled with rats, because someone outside the apartment was throwing a big bag of peanuts on the ground each night. I actually saw a rat running through this attic with a peanut in its mouth! There were so many rats in this attic, that as I was setting the traps, I heard a SNAP just ten feet behind me, and saw that I'd caught a rat already! I got 18 rats total out of this attic, and then that was it, no more rats ever caught again. That's the proper way to do rodent extermination, the fad that's sweeping the nation, it's my determination that blah blah.